G-RAID3 is the latest generation of the award winning G-RAID family of dual-drive RAID systems. 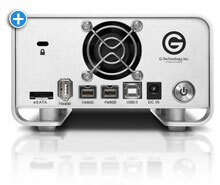 Designed specifically for professional content creation applications like Final Cut Studio, G-RAID3 now features a high-speed quad interface (3 Gbit eSATA, FireWire 400, FireWire 800 and USB2.0 ports) and is available in storage capacities up to an amazing 3TB in a compact desktop form factor! When connected via eSATA, G-RAID3 provides data transfers rates in excess of 200 MB/second to support demanding post production environments. 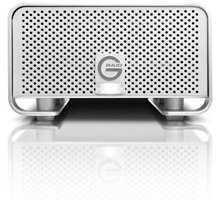 G-RAID3 is ready right out of the box for use with Mac OSX systems and appears to the system as a single, big and fast disk drive. A simple reformat is all it takes to ready G-RAID3 for use with Windows� systems**. G-RAID3 is backed by a standard 3-Year factory warranty and unlimited free technical support by representatives experienced with the latest content creation applications. G-RAID3 is guaranteed to support the simultaneous playback of multiple layers of video in real-time in Final Cut Pro, Premiere and Xpress. We stand behind this claim 100%. To unleash the ultimate performance of G-RAID3, connect the system to your workstation using one of our high-speed eSATA host adapters. Our low-cost PCIe x1 adapter provides up to 100 MB/second while our PCIe x4 card provides an amazing 200+ MB/second on reads & writes!